Previously shown to be effective for Vietnam vets, virtual reality exposure therapy, according to new research, also benefits active-duty soldiers who’ve returned from Iraq and Afghanistan. A new study in The Journal of Traumatic Stress reveals the promise of virtual reality exposure therapy for soldiers returning from Afghanistan and Iraq. After just seven sessions, soldiers reported reductions in their post-traumatic stress disorder symptoms, and almost two thirds of the soldiers found the change to be reliable and meaningful. The idea behind exposure therapy is for people with PTSD to relive their traumatic experiences in a safe environment. Traditionally, the way therapists would help soldiers access their painful memories was by asking them to vividly imagine the sights and sounds of war. Virtual reality exposure therapy (VRET) takes matters a step further by actually presenting those sights and sounds. The findings are part of a four-year study conducted by the Department of Defense National Center for Telehealth and Technology, which partnered with the Defenses Center for Psychological Health and Traumatic Brain Injury and the Department of Psychology at Madigan. 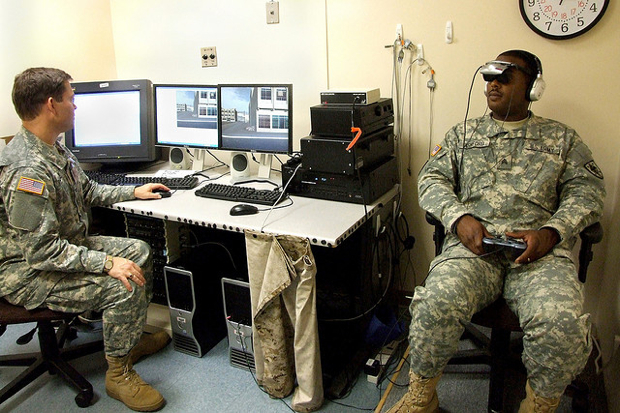 VRET uses 360-degree interactive computer-generated environments, according to the Army, running a program called “Virtual Iraq.” Patients wear a head-mounted display, while the doctor orchestrates the relevant stimuli–helicopters overhead, gunfire, or even a Muslim call to prayer. A typical session lasts 90 minutes. VRET isn’t entirely new; it had been shown to be effective in Vietnam veterans and survivors of the 9/11 attacks on the World Trade Center. Literature on the therapy extends back at least to 1999. But the recent study extends its relevance to active-duty populations. Dr. Greg Reger, lead author of the study, also thinks that since this generation of soldiers was reared on technology, it makes sense virtual reality would appeal to them. Said Reger in a press release: “It is possible that virtual reality exposure therapy would provide a more appealing treatment option to a young, technologically savvy generation of service members and veterans. In addition, it is possible that a treatment option like virtual reality exposure would be viewed by some service members as less stigmatizing than traditional treatment approaches,” thereby accessing service members who otherwise wouldn’t seek treatment. In other words: while seeing a shrink is embarrassing for certain soldiers, a video game is pretty cool. Virtual reality could help on both sides of the patient-therapist equation. About two years back, the University of Southern California School of Social Work began using an avatar representing a soldier with PTSD to help train new therapists who were sometimes intimidated by military patients.